Dev Villa is 4 km from the popular Aroma Restaurant and 4.5 km from the Karni Mata Temple. It offers a restaurant, free parking on site and free Wi-Fi access. Air-conditioned guest rooms are fitted with a fridge and cable television. The en suite bathroom comes with toiletries and shower. Airport transfers are available upon request, at a charge. The staff at the tour desk can assist with travel arrangements. The on site restaurant serves a variety of Indian and continental delicacies. Organic food can be requested at the restaurant. 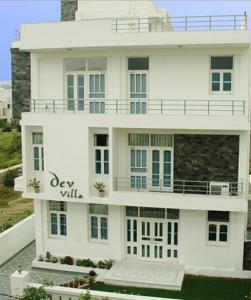 Villa Dev is 7 km from Udaipur City Railway Station and 27 km from the Maharana Pratap Airport. Free! One child under 5 years stays free of charge when using existing beds. One further older child or adult is charged INR 500 per night and person in an extra bed. Maximum capacity of extra beds in a room is 1. There is no capacity for cots in the room. Any type of extra bed or child's cot/crib is upon request and needs to be confirmed by the hotel. Supplements will not be calculated automatically in the total costs and have to be paid separately in the hotel.